Of course, the market value of gold and gold products (coins, jewelry, etc.) is prone to fluctuations in demand and the spread captured between retail investors and wholesalers. Before you dip your toes into the gold market, learn the basics of how to invest in gold and also check out Jeff Nielson's piece on why gold makes great money. Despite signals from the bond market that the U.S. economy might be headed toward a recession, few chief financial officers are preparing defensive business plans, and more of them are planning to invest extra cash rather than paying it out to shareholders, according to a new survey from the accounting firm Deloitte. The recent Russian export ban for the metal is something of a red herring, but prices for palladium could still rally 14% to hit $1,800 an ounce soon. When the central bank stops raising interest rates, prices for the yellow metal tend to rise, according to a new World Gold Council analysis. The Dow Jones Industrial Average closed higher Monday despite declines in Boeing after a deadly crash. 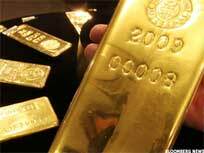 Will an Economic Slowdown Be Good for Gold? The wait for gold volatility could be ending thanks to a shift in attitude towards economic expansion.